Neuroscientists like UCSF's Michael Brainard, Ph.D., have long studied songbirds like the Bengalese finch (Lonchura striata domestica) as a model of how complex behaviors like human language are shaped by early experience. Like human language, a male finch's unique mating song is learned early in life by listening to and mimicking adult "tutors." In nature, this is usually the bird's father, but young birds raised by unrelated adults in the lab will learn to sing their foster-father's song instead. Now Brainard's lab has shown that not all early experiences are equal in their influence over impressionable young birds: exposed only to a computerized "synthetic tutor," young birds will revert to singing like a biological father they've never known or heard. The research—published the week of December 25, 2017 in PNAS—suggests that finch song has a stronger genetic component than had previously been realized, but also that this genetic drive can be suppressed by the right kind of early life experience. "What we saw is that the genetic contribution to a bird's song depends on the specifics of that bird's experience. This is a striking demonstration that heritability for complex behaviors like birdsong is not fixed, as is often assumed, but instead can vary dramatically depending on the experience of an individual," said Brainard, a professor of physiology and of psychiatry at UCSF, Howard Hughes Medical Institute investigator, and member of the UCSF Weill Institute for Neurosciences. As noted, researchers have long considered the structure of adult birdsong to be dominated by the influence of whatever song a bird hears as a chick. However, David Mets, Ph.D., a postdoctoral scholar in the Brainard lab and the new paper's first author, noticed a surprising amount of variation between the songs of individual Bengalese finches in the lab, even when all birds were exposed to the same experimentally controlled tutor song early in life. To determine whether these differences might be caused by a previously overlooked genetic contribution to the birds' song, Mets developed a careful set of experiments to control the contribution of genetics and experience. He removed eggs from their nests shortly after they were laid to ensure chicks never heard their fathers' song, even in the egg. He then exposed the hatchlings only to carefully controlled computer-generated songs, which he varied in tempo in an attempt to influence the tempo of the song the young birds would learn. To the researchers' surprise, they found that these birds largely ignored the tempo of the synthetic songs, and developed adult songs with tempos much closer to their fathers' songs—which they had never heard. The researchers quantified this observation, showing that 55 percent of variability in the experimental birds' songs could be explained by differences in their fathers' songs, but only 21 percent was driven by differences in the synthetic song they heard as chicks. In a second set of experiments, Mets got rid of the synthetic tutor and instead exposed finch chicks—which also had never heard their fathers' songs—to unrelated live adult males. The researchers were again surprised to discover a complete reversal of the results seen with synthetic tutoring: the live tutor's song contributed 53 percent to the tempo of the young birds' adult songs, with differences in their fathers' songs contributing only 16 percent. "This was really exciting because it showed that the experience provided by a live tutor can actually reduce the contribution of genetics to complex behavior like birdsong," Mets said. "We knew before that live tutors helped birds learn better and faster, but we were surprised to find that this experience can actually override the bird's genetics." "We've gotten used to the idea that complex traits and behaviors can have a big genetic component," Brainard added, citing human studies of identical twins separated at birth who nonetheless share surprising similarities in things like their sense of humor, fashion sense, and so on. "But those stories tend to assume that the genetic component is fixed—academic achievement is either 20 percent genetic or 80 percent genetic. We're showing here that the contribution of genetics is anything but fixed—in the case of academic achievement, the school you go to may well overcome any contribution of genetics." The findings raise the possibility that human genetic studies that fail to account for differences in individuals' experience could be producing misleading conclusions about the genetic contributions to complex behaviors, Brainard said. 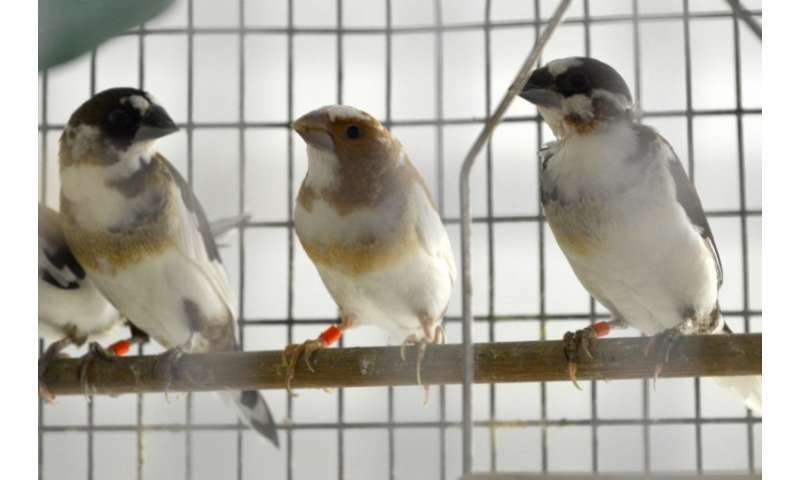 The researchers now hope to use the Bengalese finch as a model to explore how genetics and experience interact in the brain to influence complex behaviors like birdsong. "Where in the brain are the father's genes and early life experience competing for control over song tempo?" Mets asked. "That's the next really exciting question." The results also suggest a broader opportunity to understand the specific features of enriched early experiences that allows them to override genetic predispositions, Brainard said: "This is far into the future, of course, but it highlights the potential of early behavioral intervention to help mitigate negative genetic traits, such as a predisposition to psychiatric disease." Cats are better animals for working with. They can Climb, Jump, do all kinds of Athletics. Keep Amazon Alexas (of course, keeping them out of reach of cats) at various places, at various heights in a big hall (NO HUMAN IN THAT HALL) . Let Alexas or Google Echos periodically call & provide food/water after cats get near them. Also, Discourage cats approaching them without being called...i.e by giving mild shocks, spraying water at them, hitting them or sounding loud voice to drive them away. Then, publish that video on youtube ! May be they heard genetic fathers' songs while they were developing inside the Eggs was taken care of, Good ! Cats are better animals for working with. They can Climb, Jump, do all kinds of Athletics. Did you know they also EAT birds...?